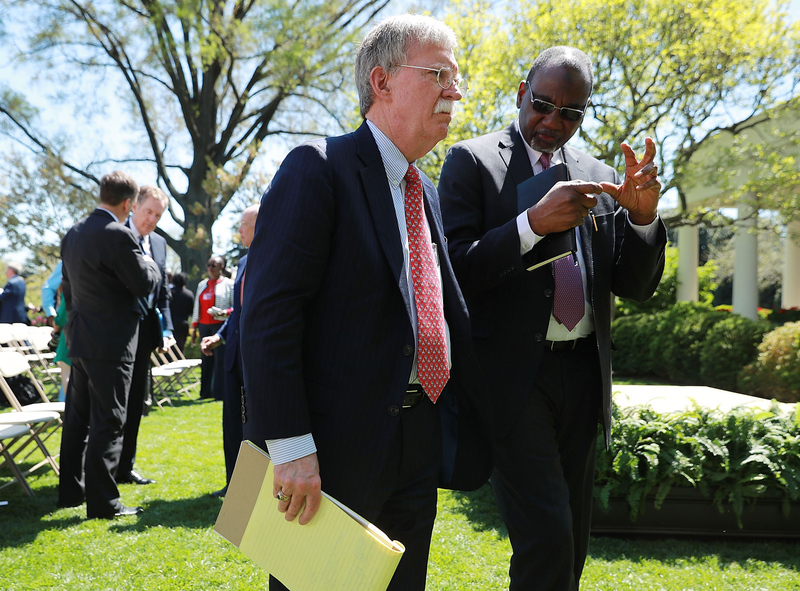 White House National Security Advisor John Bolton (center) leaves the Rose Garden following a joint news conference with U.S. President Donald Trump and Nigerian President Muhammadu Buhari at the White House in Washington, D.C., April 30, 2018. When U.S. National Security Advisor John Bolton announced Washington’s new strategy for Africa last December, he mentioned China 14 times in his speech. So often, in fact, that a lot of observers commented that the new policy seemed to be more focused on containing China’s rising influence on the continent than on Africa itself. Now, two months later, there’s been no follow-up from the White House, leaving a lot of people to wonder what’s going on and if the policy, known as “Prosper Africa,” has somehow gotten lost amid the chaos that has subsumed the Trump administration. The silence since the Bolton speech no doubt provides some reassurance to officials in Beijing even if the U.S. wanted to really challenge the Chinese presence in Africa, they just don’t seem to be up to the task. “So how concerned should China be about this new US policy towards Africa? Not very,” write professors Joshua Eisenman and Ambassador David Shinn in a column published in the South China Morning Post (SCMP). “Bolton’s statement is heavy on rhetoric, but the strategy is stillborn because the administration is not allocating the resources or manpower required for it to succeed,” they add. Meanwhile, other experts contend that the issue at hand is not about resources, but instead that China is not central to America’s long-term strategic interests in Africa. “China may get all the ink following Ambassador Bolton’s announcement of a new Africa Strategy, but the things that ought to interest Africans have far less to do with “great power” competition and more to do with bilateral U.S. individual African state relationships,” writes Colonel Chris Wyatt, Director of African Studies at the U.S. Army War College. Professor Eisenman, a China-Africa scholar at the University of Texas in Austin, joins Eric and Cobus to discuss his recent SCMP column and the current state of U.S.-China-Africa geopolitics.